The 2013 edition of the Heroes Day Cup will kick off with two sections: Masters and Challengers. The Masters section is a six-man double round-robin led by GM Mesgen Amanov of Turkmenistan (2510). He will be joined by five Caribbean Masters three of which will vie for an IM norm. All five are former national champions. The tournament commemorates the Heroes Day, a day mostly associated with developing countries who won independence by throwing off the yolk of colonialism. The day generally will honor those persons who have had a positive impact in shaping the country’s character political or social consciousness of society. The Digicel Heroes Day Cup International Chess Festival got off to a rousing start at the Amaryllis Hotel yesterday (Saturday) with local players battling the Caribbean’s best and international masters as well. In the Digicel Masters section, the USA based Turkmenistan GrandMaster, Mesgen Amanov, the tournament’s top seed overcame a stiff challenge in round one from International Master Terry Farley to register his first point on Barbadian soil. 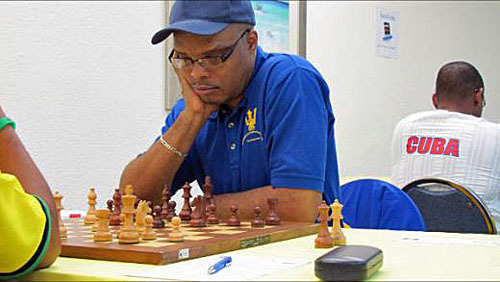 Barbados’ highest rated player International master Kevin Denny also ensured that he put points on the board, by defeating Fide Master Shane Matthews of Jamaica. Also opening his account in round one was Trinidad’s Fide Master Ryan Harper against Fide Master Delisle Warner of Barbados. IM Kevin Denny out front after two rounds. Round 2 of the Masters was equally riveting, with the 6 masters play some determined and inventive chess. Grandmaster Amanov faced Shane Matthews of Jamaica, but he found the going rather difficult and he had to struggle for a draw. Matthews eager for the win against the Grandmaster played quickly and miscalculated the endgame allowing Amanov to draw by perpetual check. The draw left the Grandmaster on 1 ½ points, ½ point behind Barbados’ top player International Master Kevin Denny who leads the pack on 2 points having defeated Fide Masters Shane Matthew and Ryan Harper in rounds 1 and 2 respectively. In the Candidates section, the top seeds, Jamaica’s Andrew Mellace, Cuba’s Roberto Castillo, Trinidadians Esan Wiltshire and Kevin Cupid, Guyana’s Taffin Khan and local players Orlando Husbands, Bryan Prescod, Allon Richards, Steven Lucas and Donna Murray scored victories in both rounds to set the stage for an exciting round 3 as the top seeds jostle for the lead. The tournament is being played at the Amaryllis Beach Hotel, Hastings, Christ Church and concludes on Wednesday, May 01, with 2 rounds being played each day. Round by round results and standings plus live streaming of the top boards from the Digicel Masters can be followed at http://www.barbadoschess.org. Bishop & Knight mate! Rarely seen.